Pitt Minion Bibles are notable for their synthesis of function and style-of readable text, in compact form-and have been a feature of the Cambridge list for over 70 years. Recently, Cambridge has developed new Pitt Minion Bibles in a range of versions, all in the same elegant format as the original KJV editions of the 1930s. Now the KJV edition has been freshly typeset as part of the current generation of Cambridge Pitt Minion Reference Bibles. In these, the text is presented in paragraph style, using a modern font that has many qualities in common with the traditional Bible typefaces. In the Pitt Minion design it delivers the characteristic combination of clarity with economy of form-producing a slimline Bible that is exceptionally clear and easy to read. 7.50" x 5.00" x 1.00"
The edition includes 15 newly designed colour maps, and a Reader's Companion (combining some of the features of a traditional concordance and dictionary). This Bible is splendidly bound in brown goatskin leather and has art-gilt edges. KJV Pitt Minion Reference Edition Brown Goatskin was published by Cambridge University Press in September 2012 and is our 31832nd best seller. The ISBN for KJV Pitt Minion Reference Edition Brown Goatskin is 9781107654525. 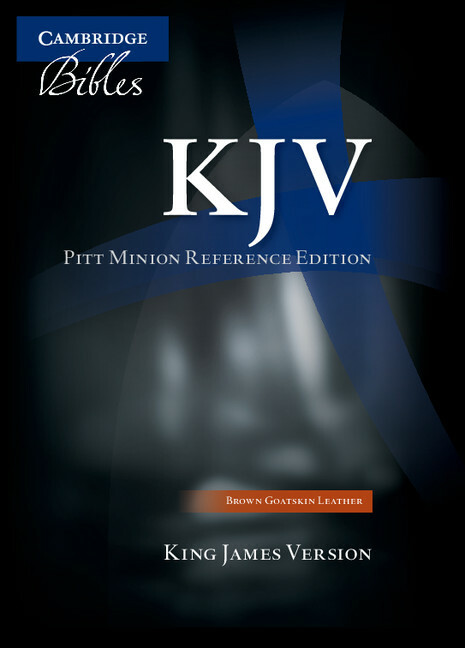 Be the first to review KJV Pitt Minion Reference Edition Brown Goatskin! Got a question? No problem! Just click here to ask us about KJV Pitt Minion Reference Edition Brown Goatskin.